VINEYARD HAVEN – The Steamship Authority has taken another one of its vessels out of service after an issue came up on board, leaving the boat line shorthanded on its runs to and from Martha’s Vineyard. The M/V Woods Hole had an indicator light come up on its console while it was loading for Thursday’s 5 p.m. trip from Vineyard Haven to Woods Hole. The Steamship Authority then transferred the passengers and vehicles onboard to the M/V Katama for the trip to the Cape. Officials then brought the vessel to Woods Hole for inspection by Steamship Authority engineers, the Coast Guard, and the manufacturers. The decision was then made to transfer the ship to the Fairhaven maintenance facility for additional work. 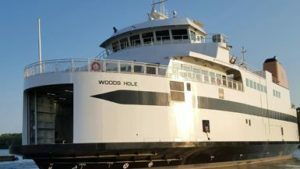 The M/V Woods Hole is the Steamship Authority’s newest vessel. It went into service in 2016. The M/V Martha’s Vineyard is also out of service this week after it lost power on a run between the island and Woods Hole over the weekend. The vessel also experienced a generator issue Tuesday night, leading the Steamship Authority to send it to Fairhaven for repairs. The M/V Sankaty is currently handling the runs assigned to the M/V Martha’s Vineyard. With two vessels now out of service, the Steamship Authority has partnered with SeaStreak to provide a passenger only vessel for the time being. That ship will run a shuttle service to and from Martha’s Vineyard for walk-on passengers. It will not run a set schedule and the boat line hopes to provide a trip in each direction on an hourly basis. The Steamship Authority has been forced to cancel a number of vehicle reservations on the M/V Woods Hole’s trips and advises customers to contact their ticket office to find out if they are among those affected. There will be no vehicle standby travel on Friday. “We deeply regret the inconvenience this may cause, and will provide an update as we get more information,” said Steamship Authority General Manager Robert Davis.